Abstract: This article describes what you need to do to get your code ready for Delphi 2009. As discussed in Part I of this series, we saw Delphi 2009 will use by default a UTF-16 based string. As a result, certain code idioms within existing code may need to be changed. In general, the large majority of existing code will work just fine with Delphi 2009. As you’ll see, most of the code changes that need to be made are quite specific and somewhat esoteric. However, some specific code idioms will need to be reviewed and perhaps have changes made to ensure that the code works properly with UnicodeString. should be reviewed to ensure that those assumptions are not persisted in code. Code that writes to or reads from persistent storage needs to ensure that the correct number of bytes are being read or written, as a single byte no longer represents a single character. Generally, any needed code changes should be straightforward and can be done with a minimal amount of effort. This section discusses area of code that should continue to work, and should not require any changes to work properly with the new UnicodeString. All of the VCL and RTL have been updated to work as expected in Delphi 2009, and with very, very few exceptions, such will be the case. For instance, TStringList is now completely Unicode-aware, and all existing TStringList code should work as before. However, TStringList has been enhanced to work specifically with Unicode, so if you want to take advantage of that new functionality, you can, but you need not if you don’t want to. In general, code that uses the string type should work as before. There is no need to re-declare string variables as AnsiString types, except as discussed below. String declarations should only be changed to be AnsiString when dealing with storage buffers or other types of code that uses the string as a data buffer. The runtime library additions are discussed extensively in Part II. That article doesn’t mention a new unit added to the RTL – AnsiString.pas. This unit exists for backwards compatibility with code that chooses to use or requires the use of AnsiString within it. Runtime library code runs as expected and in general requires no change. The areas that do need change are described below. The entire VCL is Unicode aware. All existing VCL components work right out of the box just as they always have. The vast majority of your code using the VCL should continue to work as normal. We’ve done a lot of work to ensure that the VCL is both Unicode ready and backwards compatible. Normal VCL code that doesn’t do any specific string manipulation will work as before. Copy will still work as before without change. So will Delete and all the SysUtils-based string manipulation routines. Calls to Length(SomeString) will, as always, return the number of elements in the passed string. Calls to SizeOf on any string identifier will return 4, as all string declarations are references and the size of a pointer is 4. Calls to Length on any string will return the number of elements in the string. This code will work exactly the same as with previous versions of Delphi – but of course the types are different: PChar is now a PWideChar and MyString is now a UnicodeString. 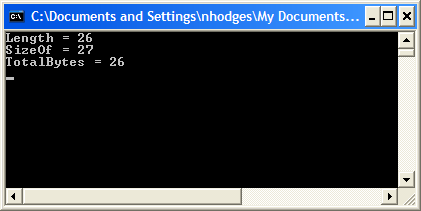 ShortString remains unchanged in both functionality and declaration, and will work just as before. Note that the total bytes of the alphabet is 26 – showing that the variable is holding AnsiChars. This record will be laid out in memory exactly as before – it will be a record of two AnsiStrings with AnsiChars in them. If you’ve got a File of Rec of a record with short strings, then the above code will work as before, and any code reading and writing such a record will work as before with no changes. This next section describes the various semantic code constructs that should be reviewed in existing code for Unicode compatibility. Because Char now equals WideChar, assumptions about the size in bytes of a character array or string may be invalid. The following lists a number of specific code constructs that should be examined to ensure that they are compatible with the new UnicodeString type. SaveToFile and LoadFromFile calls could very well go under the “Just Works” section above, as these calls will read and write just as they did before. However, you may want to consider using the new overloaded versions of these calls if you are going to be dealing with Unicode data when using them. The second method above is the new overload that includes an encoding parameter that determines how the data will be written out to the file. (You can read Part II for an explanation of the TEncoding type.) If you call the first method above, the string data will be saved as it always has been – as ANSI data. Therefore, your existing code will work exactly as it always has. However, if you put some Unicode string data into the text to be written out, you will need to use the second overload, passing a specific TEncoding type. If you do not, the strings will be written out as ANSI data, and data loss will likely result. Therefore, the best idea here would be to review your SaveToFile and LoadFromFile calls, and add a second parameter to them to indicate how you’d like your data saved. If you don’t think you’ll ever be adding or using Unicode strings, though, you can leave things as they are. If code using the Chr function is assigning the result to an AnsiChar, then this error can easily be removed by replacing the Chr function with a cast to AnsiChar. A common idiom is to use a string as a data buffer. It’s common because it’s been easy --manipulating strings is generally pretty straight forward. However, existing code that does this will almost certainly need to be adjusted given the fact that string now is a UnicodeString. There are a couple of ways to deal with code that uses a string as a data buffer. The first is to simply declare the variable being used as a data buffer as an AnsiString instead of string. If the code uses Char to manipulate bytes in the buffer, declare those variables as AnsiChar. If you choose this route, all your code will work as before, but you do need to be careful that you’ve explicitly declared all variables accessing the string buffer to be ANSI types. The second and preferred way dealing with this situation is to convert your buffer from a string type to an array of bytes, or TBytes. TBytes is designed specifically for this purpose, and works as you likely were using the string type previously. In the above code, Length will return the number of characters in the given string (plus the null termination character), but SizeOf will return the total number of Bytes used by the array, in this case 34, i.e. two bytes per character. In previous versions, this code would have returned 17 for both. Length returns the size in characters but FillChar expects Count to be in bytes. In this case, SizeOf should be used instead of Length (or Length needs to be multiplied by the size of Char). will recognize the Euro symbol and thus evaluate to True in most ANSI codepages. However, it will evaluate to False in Delphi 2009 because while #128 is the euro sign in most ANSI code pages, it is a control character in Unicode. In Unicode, Euro symbol is #$20AC. Length returns the size in characters but Move expects Count to be in bytes. In this case, SizeOf should be used instead of Length (or Length needs to be multiplied by the size of Char). Note: The solution depends on the format of the data being read. See the new TEncoding class described above to assist in properly encoding the text in the stream. Note: The solution depends on the format of the data being written. See the new TEncoding class described above to assist in properly encoding the text in the stream. Temp := Utf8Encode(Str); // <-- Str is the string being written out to the file. //Write(Pointer(Str)^, Length(Str)); <-- this is the original call to write the string to the file. TStringStream now descends from a new type, TByteStream. TByteStream adds a property named Bytes which allows for direct access to the bytes with a TStringStream. TStringStream works as it always has, with the exception that the string it holds is a Unicode-based string. This method is deprecated, and as such, is hard-coded to use AnsiString and no UnicodeString overload is available. Or, better yet, use the new TStringBuilder class to concatenate strings. Note: Windows.pas will provide an overloaded method that will do this conversion. In the above snippet, Node is not actually character data. It is being cast to a PChar merely for the purpose of using pointer arithmetic to access data that is a certain number of bytes after Node. This worked previously because SizeOf(Char) = Sizeof(Byte). This is no longer true, and to ensure the code remains correct, it needs to be change to use PByte rather than PChar. Without the change, Result will end up pointing to the incorrect data. If you have code that uses TVarRec to handle variant open array parameters, you may need to adjust it to handle UnicodeString. A new type vtUnicodeString is defined for use with UnicodeStrings. The UnicodeString data is held in vUnicodeString. See the following snippet from DesignIntf.pas, showing a case where new code needed to be added to handle the UnicodeString type. "The Unicode version of this function, CreateProcessW, can modify the contents of this string. Therefore, this parameter cannot be a pointer to read-only memory (such as a const variable or a literal string). If this parameter is a constant string, the function may cause an access violation." Because of this, some existing code that calls CreateProcess may start giving Access Violations when compiled in Delphi 2009. The following is a list of code patterns that you might want to search for to ensure that your code is properly Unicode-enabled. Search for instances “string[“ to ensure that the characters reference are placed into Chars (i.e. WideChar). Check for the explicit use of AnsiString, AnsiChar, and PAnsiChar to see if it is still necessary and correct. Search for Copy(, Seek(, Pointer(, AllocMem(, and GetMem( to ensure that they are correctly operating on strings or array of Chars. They represent code constructs that could potentially need to be changed to support the new UnicodeString type. So that sums up the types of code idioms you need to review for correctness in the Unicode world. In general, most of your code should work. Most of the warnings your code will receive can be easily fixed up. Most of the code patterns you’ll need to review are generally uncommon, so it is likely that much if not all of your existing code will work just fine. The process to Unicodify your code shouldn´t be to hard.... unless you´ve got a project with more than 2 million lines of code as we do! Yes, it is wrong. It should be SizeOf(Buf), as explained in the section before that. I found printing from "Edit Content" button (on the top right corner of this article) then open the .doc file using M$-Word gives better layout. What about the data type mapping in databases?